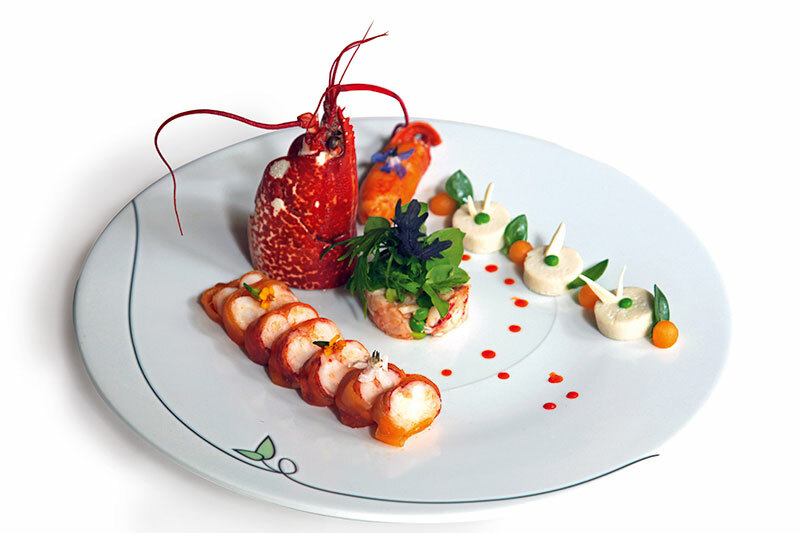 Louis Fouquet, wherever he may be in gourmet heaven, must be smiling down with satisfaction. The eponymous restaurant he founded over a 100 years ago is once again the toast of tout Paris. And it’s not just thanks to its five-star location on the Champs Elysées with a cinematic view of the Arc de Triomphe. Credit for Le Fouquet’s triumphant comeback five years ago, can be laid fair and square on the seemingly fragile shoulders of a rather humble chef. Jean-Yves Leurangeur is the exact opposite of, let’s say, a Gordon Ramsay. If the latter’s name and fame are past their sell-by date, Leurangeur’s legend grows by the day. Like all truly talented people, Jean-Yves dons a toque of diffidence and creativity, allowing his dishes to demonstrate his culinary art-de-vivre. 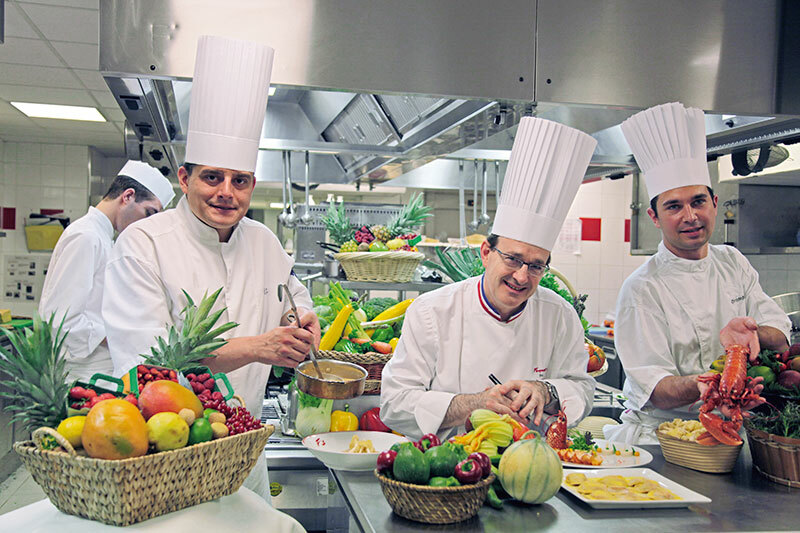 Nearly 90 chefs work under him, serving both discerning Parisians and tourists who travel from all over the world in quest of the gastronomic grail. Le Fouquet’s, the restaurant, mints as many millions every year in profits as does its parent, the luxurious, five-star Hotel Fouquet’s Barrière. Think about it like this: name one restaurant of any Taj, Oberoi or ITC hotel that rivals its parent hotel’s profits! On this Wednesday of a Parisian summer, I have arrived at Le Fouquet’s with a double desire. To celebrate my birthday with a memorable meal and to persuade Jean-Yves to create two of his specials. Both specialties happen to be the rage in Paris ever since the media revealed that they are the preferred dishes of French president Nicolas Sarkozy and his wife Carla Bruni! Long drops of rain, like unravelling bundles of thread are falling on the busiest avenue in Paris. Inside Fouquet’s, I feel I’m in a mini mistral. In each section of this vast, evocatively dressed Belle Époque restaurant, diners arrive and depart with expectation and satisfaction respectively. Regular guests are treated with familiar deference and led to their favourite tables, reserved in advance. Well-heeled tourists discover which name plaques they are seated at. ‘La Table Préférée du…’ reads each prefix. The preferred table of Édith Piaf is where I’m seated. At this very special table, I partake of a memorable three-course meal with my friend Ute Benedikt. My delicately herbed gazpacho is followed by the two dishes that have enthralled Mrs and Mr President. Later, I will be led inside the hallowed precincts of the kitchen, where Jean-Yves, master of all he surveys, will present an exclusive for Verve readers. But right now, another delight. Jean-Yves arrives at my table, a perceptible hush following his stride through this restaurant, as regulars catch his eye. A beaming waiter follows in his wake, bearing a huge chocolate gateau, its icing spelling out Bon Anniversaire, topped by a lit firecracker fountain. To my astonishment, the couple at the adjacent table join in the singalong French version of Happy Birthday! Who says the French are unfriendly? Jean-Yves has happy news of his own to share. His daughter Emeline has graduated as a qualified nurse for handicapped children this very day. This double celebration calls for a fresh round of my favourite champagne Billecart-Salmon. So how did Jean-Yves come to be the head chef of a legendary restaurant that had lost its shine in the ’80s and ’90s? His story: “My papa worked as a chef on sea cruise liners. So when I told him at age six that I wanted to be just like him, he smiled indulgently. I first learned to make bread. But my initial attempts were so bad that the bread was not edible even for the birds! A few years later, when I was about 11, I made sausage and potato stew which my father pronounced, pas mal (not bad).” Encouraged by this, he finished elementary school and then added to his curriculum vitae a degree in hospitality from a reputed university. At age 22, he worked for a tyrant of a restaurateur, who made his life miserable for two years. But valuable lessons were learnt. Lessons that would serve him well as he climbed the chef’s career ladder. So here’s what Jean-Yves lives by: gastronomy is synonymous with sensuality. This philosophy is imprinted by years of working in hotels and restaurants across France’s culinary map; holding workshops in Switzerland, Thailand, China, USA; garnering not just accolades but awards-to-kill-for like Meilleur Ouvrier de France and Chevalier de l’Ordre National de Merite. When the Lucien Barrière group headhunted to find that visionary who would restore Fouquet’s restaurant to its former glory, only one man fit the bill, but he had to be seduced from his lofty perch at a five-star Cannes luxury hotel. 1 large lobster, shallots, olive oil 200g, thyme, laurel, melon 1kg. Tomatoes 200g, celery 1 stalk, onions 50g, shallots 100g, olive oil 1 litre. In a casserole, boil the lobster in water. When red, remove to a cold water bath. Grasp the centre piece of the tail, twist and pull out. Pull apart sections of the claws and remove the meat carefully. Keep aside the oily water in which the shells were boiled. Next make broth. Chop shallots, thyme, laurel into small pieces. Heat the olive oil until just smoking in a heavy-based saucepan. Add the vegetables and stir until golden. Quickly add the crustacean oil and then process it all to a puree and strain. Pour this very lightly on the lobster meat kept ready. Cut thin slices of melon and cover the lobster meat with them. Make a salad with the ingredients mentioned above, tossed in the chardonnay vinaigrette. If you like, you can also make blancmange circles out of milk, almond powder and gelatine to compose the plate as shown in the photograph. . Lobster 2 kg, shiitake mushrooms, shallots, parsley, garlic, tomatoes, onions, ravioli pasta dough 1 kg, cream. Bring the lobster meat to a parboil. Dissect and mince. Wash the mushrooms and sauté with parsley chopped flat. 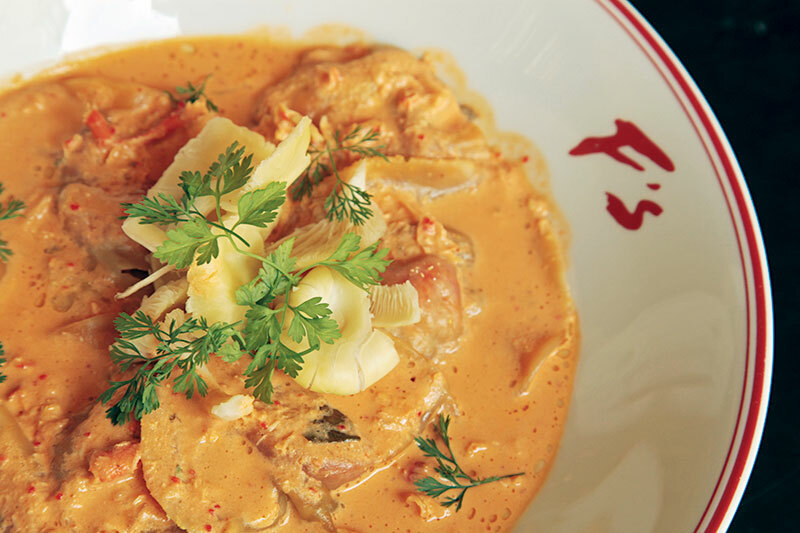 Make squares of 5 x 5 cm in ravioli dough, then garnish with mixture of mushrooms and lobster. Close the squares of pasta and then collapse them to get the ravioli shape. Put the ravioli (calculate 4 pieces per person) in simmering water and remove when al dente. Heat 2 tablespoons olive oil in a heavy-based saucepan. Add onion, carrot and garlic and cook for another 5 minutes, (if you like, add wine or port) until reduced by half. Add tomatoes, parsley, bring to a boil and simmer for 15 minutes. Strain through a fine sieve, pressing with a spoon to extract as much liquid as possible. Transfer liquid to a clean saucepan, add cream, then season to taste with sea salt and freshly ground black pepper. The hottest new palace hotel in Paris, Hotel Fouquet’s Barrière has become a magnet for the super rich and famous. Johnny Depp, Robert de Niro, John Travolta, L N Mittal, Nicole Kidman to name just a few. 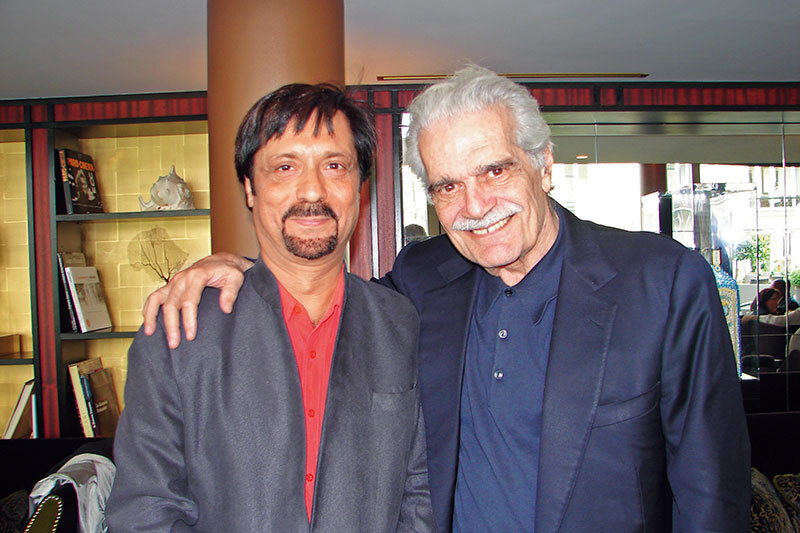 As fate would have it, I ran into Omar Sharif who very graciously agreed to have a vodka tonic with me and reminisce about how much he used to enjoy visiting Bombay. The hotel stands prominently on the corner of two fabled boulevards: the Champs Elysées and Avenue George V. The building’s extraordinary design is a contemporary masterpiece, fusing the old and new. It comprises of five Haussman-style buildings located around a central interior garden. The hotel’s interiors are just as remarkable. World-renowned interior designer Jacques Garcia has created 107 lavish guestrooms in a combination of Art Deco and empire style. Utilising rich velvets, leather, gold leaf, sharkskin, precious marble and plush fabrics, each living space recalls Venetian luxury. In my posh, imperial suite, fresh fruit, chocolates and bottles of the finest Evian and Cesar mineral water, pampered me. A 24×7 butler service catered to my every whim. Accoutrements and accessories in each suite are there for a purpose. A flick of a button makes a hidden, enormous flat screen TV rise up from nowhere. I could waltz in my bathroom, a mini-spa, decked out in marble, with large bath and separate walk-in rain shower room. Every night in my king-sized bed, I’d go to la la land to the sound of faint laughter floating up from the world’s most famous avenue.